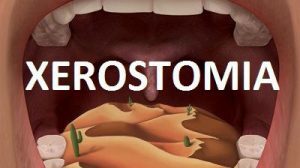 Xerostomia describes the sensation of oral dryness and is commonly called “dry mouth.” Some typical causes of dry mouth include medications, radiotherapy to the head and neck for cancer treatment, and systemic diseases. A dry mouth can lead to taste changes, which in turn can decrease appetite, and can lead to weight loss, malnutrition, and social isolation. Saliva also has important antimicrobial properties. Chronic dry mouth can increase the risk for dental problems, erosion of the enamel of the teeth and other dental defects. Saliva flow lubricates the soft tissues of the mouth, protecting the mucosa and gingiva from extreme dryness, abrasions and ulceration. Good oral care and frequent professional cleanings are especially important for those who suffer from dry mouth. Salivary flow can be stimulated through the use of medications prescribed by your doctor. Salivary stimulants such as Pilocarpine (Salagen®) and Cevimeline (Evoxac®) are the most widely studied pharmacological interventions for dry mouth. Pilocarpine is often prescribed in either tablet or lollipop form, allowing for a consistent increase in salivary flow with tablet administration or on an as needed basis with the lollipop. Simply chewing can stimulate saliva flow. Chewing several times a day, rather than relying on a full liquid diet, can be helpful and should be encouraged. Try chewing sugar free gum.